Another item I’ve worn an absurd amount this season is this pair of cognac suede over-the-knee boots (similar pair under $50!!!). Flat over-the-knee boots are an essential for me – you’ve already seen me in this black leather pair a bunch of times (which I LOVE! ), but instead of buying the Lowland boots in another color, I found this pair of Sergio Rossi boots on major sale on Black Friday – they were the last pair and just so happened to be in my size! I really lucked out. I wear them with EVERYTHING. Literally every color in my winter wardrobe works with these boots. Just check out my Instagram for more inspiration on how to style a pair like these! What are the pieces you can’t stop wearing this season? These photos are beautiful and you look stunning! Love this casual look, great boot! 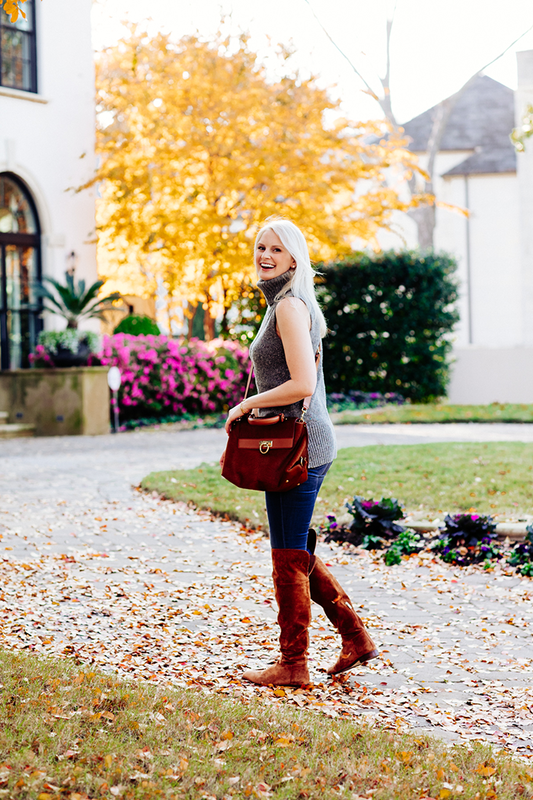 I can’t get over how gorgeous those suede boots are – LOVE this look! Those OTK boots are to die for. Just gorgeous. Love everything about this look! 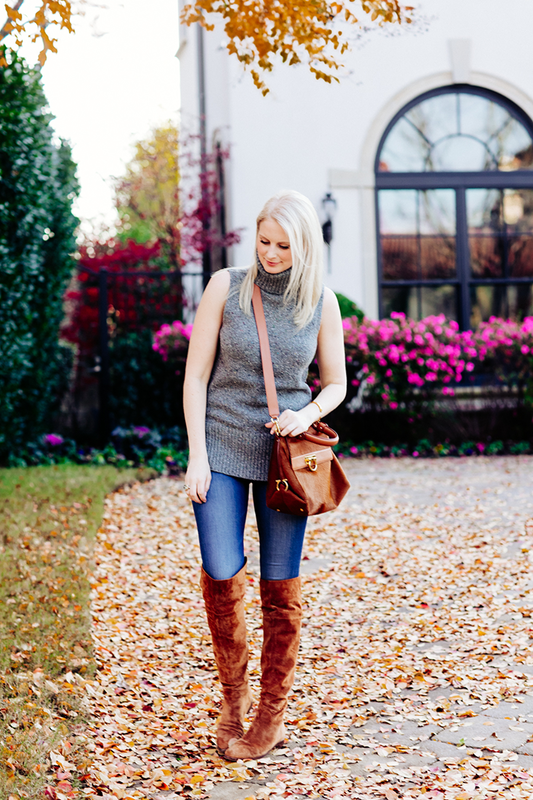 Those boots are gorgeous and I’m coveting that easy and chic sleeveless turtleneck! this sweater is amazing! maybe too cold for Chicago now, but I’d love it for spring and fall! this bag is also gorgeous! hope you’re having a happy new year! Cute! 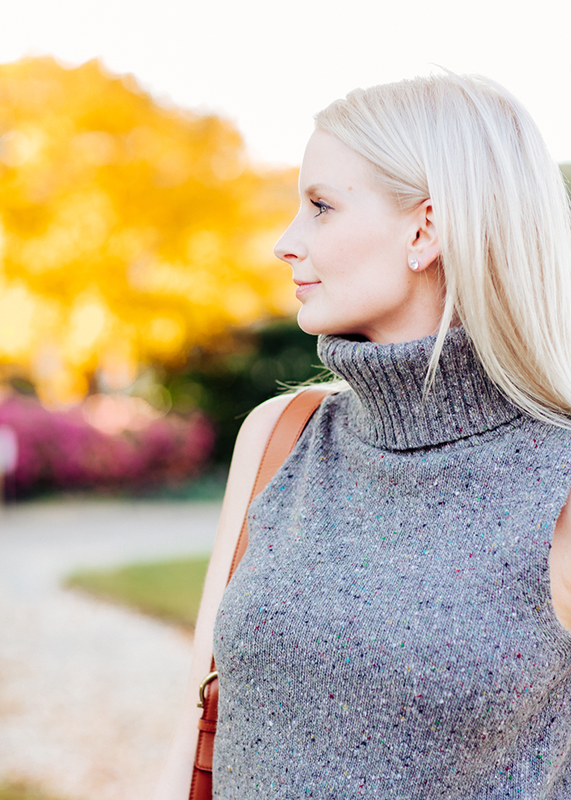 I love a good sleeveless sweater, and that gray is gorgeous with the cognac accessories! Gorgeous pieces, i can see why they are on repeat. Have a great new year girl. This outfit is perfect, great casual look! I love the outfit you are wearing. Looking gorgeous.